The Exhibition will showcase 1000+ properties 100+ top developers (exhibitors), 15+ Banks with never seen before offers to cater to the expectations of 75,000+ buyers and a tie-up with online realty portal housing.com for the Third time. 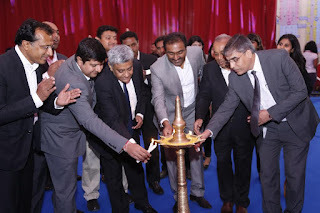 Mumbai 7th April 2016: MCHI – CREDAI’s 26th Property Exhibition 2016, one stop shop for all the potential property buyers was unveiled with great enthusiasm at Bandra – Kurla Complex, MMRDA Grounds. Shri Deepankar Bose, Chief General Manager, State Bank of India lit the inaugural lamp in the presence of an august gathering. Keeping the positive sentiments of the property buyers in mind, MCHI – CREDAI expo has added festive cheer for its buyers who are all set to press the “Buy now” button on the auspicious occasion of Gudi Padwa. The real estate sector anticipates a fruitful year ahead, especially after recent steps taken by government which includes passage of real estate bill, repo rate cut by the central bank and various sops announced in Union Budget 2016 particularly to boost affordable housing, have spread optimistic sentiments amongst the property buyers and the industry. Keeping in mind and acknowledging this positive environment, MCHI – CREDAI has left no stone unturned to offer astounding offers to the homebuyers. The theme for this edition “Buy Now” encouraged the property buyers to scout for opportunities. Over the span of past 15 years and 25 Editions of Property Exhibitions, many buyers have realized their dream of owning Real Estate after a visit to the MCHI – CREDAI Property Expo. This is after the stupendous success of MCHI-CREDAI’s Silver Jubilee – 25th Edition of Expo held in the month of October, 2015. The Expo will be open for general public from 10 AM to 8 PM from 7th April & 8th April and from 11AM to 9PM on 9th and 10th April 2016 at MMRDA Grounds, BKC, Mumbai. The Maharashtra Chamber of Housing Industry (MCHI-CREDAI) was formed in 1982, and is one of the most prominent and the recognized body of Real Estate Developers in Mumbai and MMR. MCHI-CREDAI brings together members dealing in Real Estate Development on one common platform to address various issues facing the Industry. With a strong Membership of over 1800 leading Developers in Mumbai and The MCHI-CREDAI has expanded across MMR, having its own units in Thane, Kalyan -Dombivali, Mira - Virar City, Raigad and Navi Mumbai. MCHI-C REDAI is recognized by Government of Maharashtra and the Central Government and helps in meeting their objectives of providing housing, which is a basic necessity. Founded in 2012, Housing.com is India's leading online real estate platform with 1.7 million verified homes listed to date, and an unparalleled online user experience. The Company is a technologically innovative real estate platform with a larger vision to bring more transparency, efficiency and trust across the real estate ecosystem in India. Housing.com is the only provider of independently verified listings of every home listed, conducted by a trained team of data collectors, analysts, auditors and photographers. With over 120 data points per listing, the in-house Data Sciences Lab is empowered with a significant body of information to allow buyers and sellers to make more informed decisions. Housing.com is passionate about taking a 360 degree view on solving India's real estate challenges. Housing.com has led a number of strategic acquisitions, such as the largest community forum on buying and selling homes (Indian Real Estate Forum), an established company focused on doing due diligence of new real estate projects (Realty Business Intelligence), and a popular software for developers to manage and enhance their marketing and sales efforts (HomeBuy360). Housing.com has raised over $100 million in capital from India's leading investors, including Softbank, Nexus Ventures, Falcon Edge, Helion Ventures, Nirvana Ventures, Qualcomm, DST founder Yuri Milner, Viacom 18 co-founder Haresh Chawla, Snapdeal founders Kunal Bahl and Rohit Bansal, among others.